Join us the first Saturday of each month March - October! 9 - 11 a.m.
We can't wait to see you guys and gals again at our 2015 season premier this Saturday, March 7th! This year, we will have some new and exciting features as well as a very special guest this week. 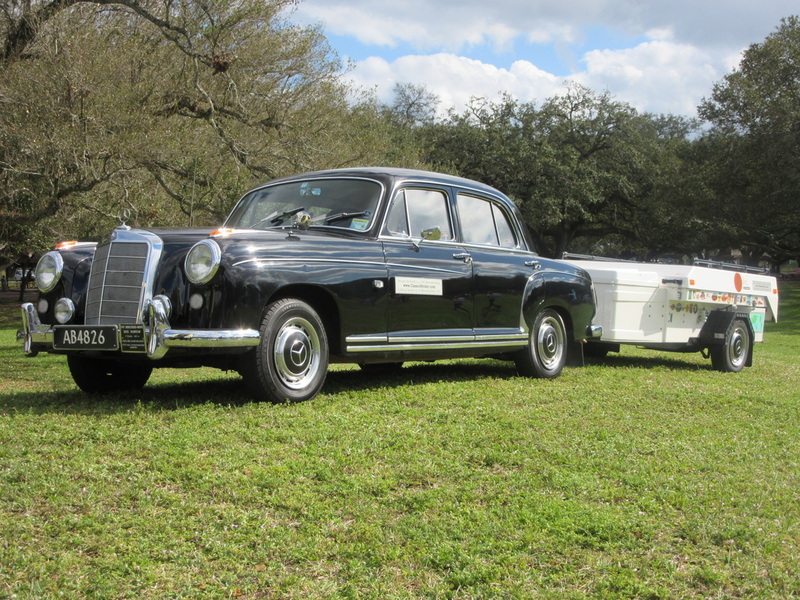 One of our clients at Arts Star Classics, Fred and Elisabeth Smits from New Zealand, have spent two years prepping a 1957 Mercedes-Benz Ponton and planning to take it on a 5 year world tour. Year one is here in North America. 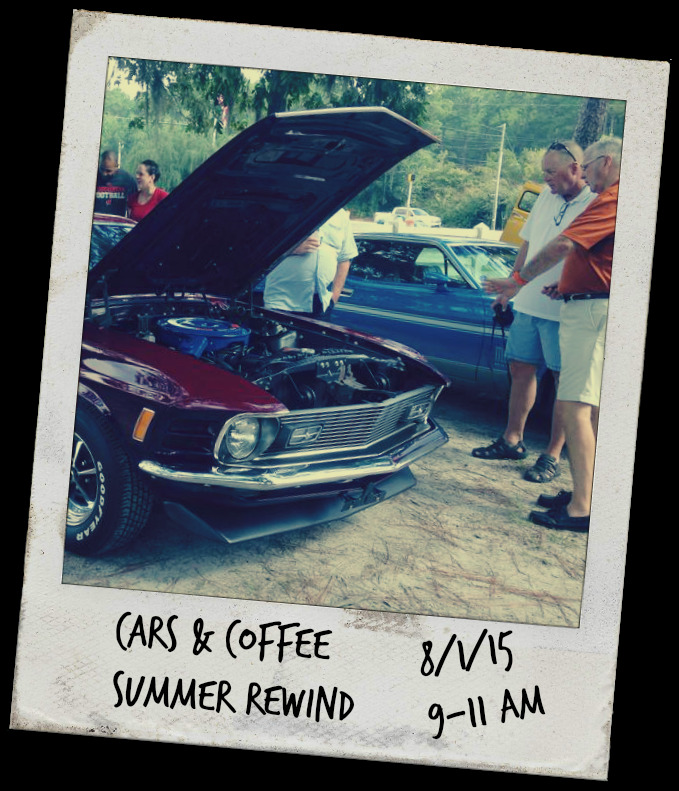 On August 3rd of last year, they started on the other coast and after some 14,000 miles are now in St. Augustine and will join us with their car and camper for Cars & Coffee this Saturday! You will want to plan to stay a little later for at 11:00 we will be treated to a presentation featuring Fred and Elisabeth's planning and preparations, and the story of their tour to-date. The presentation will include historic videos of Mercedes-Benz racing and Road Rallies over the last 50 years. There will be opportunity for questions. Afterwards, we can all head to Fish Tales for lunch on the river! I know some of you have been working on new acquisitions and readying your trusted rides. This is the time to bring them out and show them off! We will have a special new 2015 pin waiting for you! Our regular CARS & COFFEE kicks off the first Saturday in March.... but we have a special treat for you! We are partnering wit Fort McAllister State Historic Park for a special event "RIDES & REBELS" on February 7th! Event will run from 10:00 A.M. to 4:00 P.M. $6.00 per person, children under 6 free. Visitors entering a vehicle admitted free. Those wishing to enter a vehicle should contact Park Manager Jason Carter @ 912-727-2339 or Art Thumwood @ 602-397-5300. Any classic, custom, muscle or exotic car is welcome to attend! Lunch will be served to staff, volunteers, and participants. Don't forget to RSVP. The Dinner Cruise is set up for Sat. 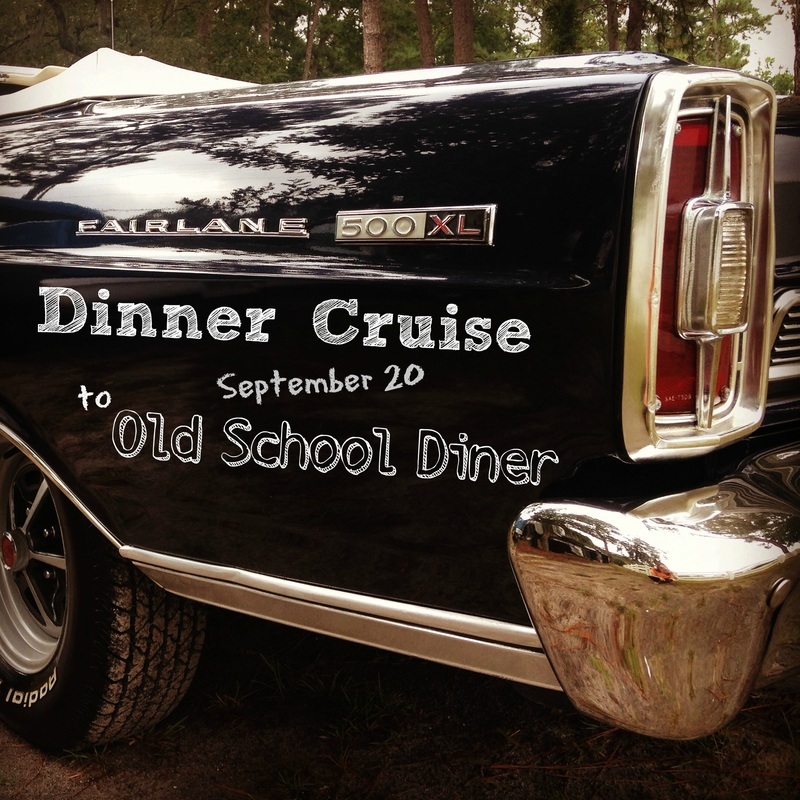 Sept 20th at 5:30pm from the Richmond Hill Museum to the Old School Diner in Townsend. We have a fixed price of $35 per person, includes tip and gratuity. Dinner includes ALL you can eat and drink (Does not include alcohol drinks), it’s called the Wheel chair buffet. We need to have a minimum of 20 dinner tickets sold to get this special price, so click the photo above to pay for your tickets or drop by the museum this Sat. between 10am to 3 pm. Your payment is your RSVP and MUST be paid before Sept 18th. With this special dinner price plus the Museum will also receive a $5 donation per dinner sold, so come join us for the dinner cruise - it’s a win, win for everyone. We couldn't have asked for a better Saturday for the April Cars & Coffee. We had beautiful weather, a great crowd and lots of beautiful cars, unique cars, and one extremely unusual c! Thank you to our sponsor, Fish Tales. We enjoyed a wonderful lunch on the Great Ogeechee River. 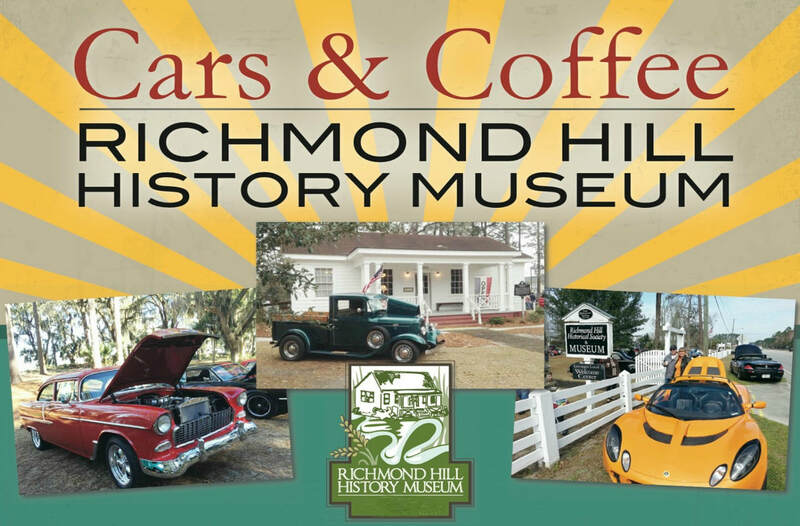 Our next CARS & COFFEE will take place on Saturday, April 5th on the grounds of the historic Richmond Hill Museum. We will have a new and improved coffee station and breakfast pastries delivered by Espresso Hill. Wake up with a fresh cup of coffee for the old fashioned price of $.25 with a $1.00 donation to the Museum. If you have a car you would like to display, or if you are part of a car club and would like to participate, click here. Don't have a car to show? This event is free and open to the public. Bring the family to see the unique cars and tour the Richmond Hill History Museum too! Fish Tales restaurant is our April sponsor. A local favorite, Fish Tales is located on the beautiful Ogeechee River at the Fort McAllister Marina. Participants can join our cruise to Fish Tales for lunch. We will leave the museum grounds shortly after 11 a.m. Hope to see you! Click here to review their menu and pricing.